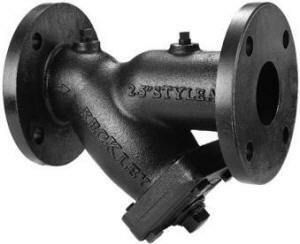 The Keckley Company was established in 1914 and they offer, by far, the largest variety of cast Y strainers in the world. Whereas most pipeline strainer manufactures offer cast iron, ductile iron, steel, 316SS and bronze, Keckley also offers Monel, Hastelloy C, Alloy 20, Titanium, Chrome Moly and Duplex SS. Almost all materials are available for ½" to 8" size pipelines with some of the more common materials (such as steel and iron) for pipeline sizes up to 24".